← Procrastinators: listen up! Preparedness classes fill up fast! Watch or join the citywide Tabletop Exercise on November 14th! 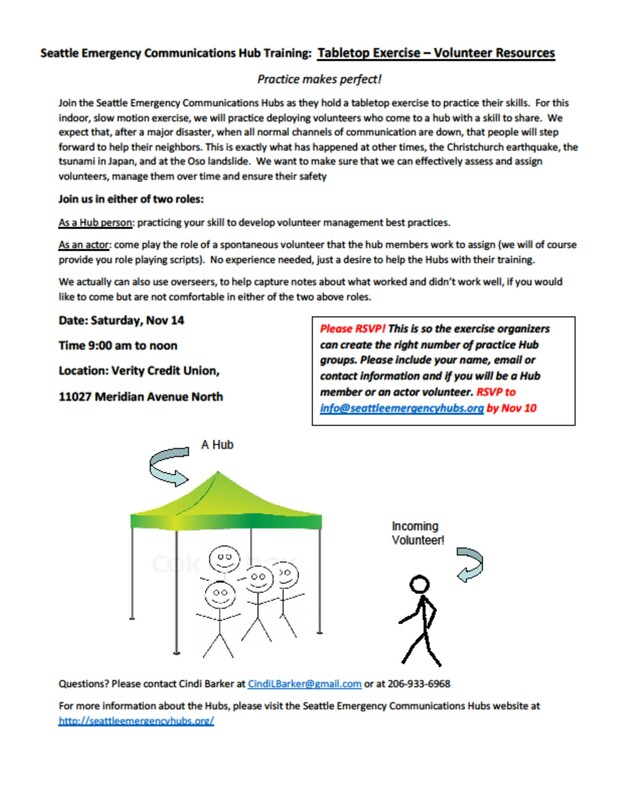 As you may have noted on our West Seattle Be Prepared calendar, there will be another citywide exercise on November 14th! This will be an indoor Tabletop Exercise focused on hub volunteers. It runs from 9 AM until NOON at the Verity Credit Union in north Seattle. You are invited to watch or participate in various ways. See our full calendar listing here or view the attached flyer, Tabletop for Volunteer mgmt Nov 14 2015 (.pdf format), for more details. This will be an excellent opportunity to learn more about how emergency communication hubs will function during an emergency. FYI, prior to the tabletop exercise, you can learn more about hub operations and roles in the About the Hubs section of our website. Participate in a Citywide Tabletop Exercise on November 14th! This entry was posted in Announcements, Earthquake Preparedness, Events, Radio Drills & Field Exercises, West Seattle Be Prepared and tagged communications drill, Seattle Emergency Communications Hub, Tabletop exercise, West Seattle emergency communication, West Seattle Emergency Communication Hubs, West Seattle emergency preparedness. Bookmark the permalink.